In order to have a discussion on suffering one must perhaps first look at the presence of a will to live. Many times humans or animals will indeed be seen as suffering at any stage of their life, but if they have the will to live and can find some joy in their day, then who would take life away from them? Everyone suffers at one level or another, so it is a difficult conversation when held at a time close to the end of life. Life can become uncomfortable, difficult if immobilized in some way, or painful. That is perceived by most as suffering, and probably rightly so, but does that warrant death? When that human or animal sits up later and happily devours a great dinner, or laughs at the TV, or bats at a fly, or comes for a cuddle at bedtime—does that warrant death? Animals are sentient beings, possessed of enormous wisdom, who tell their people when they are ready to go and whether they would like to be euthanized or whether they will be going naturally. The more people are tuned in to their animal, the more they will make decisions with their animal and out of love for them, and the more they will be following the universe’s Divine Plan, in harmony with all Creation. Modern day medicine has made great advances in recent times in the area of pain control, and much can be done to relieve signs of pain, which in turn equates to suffering in many minds. 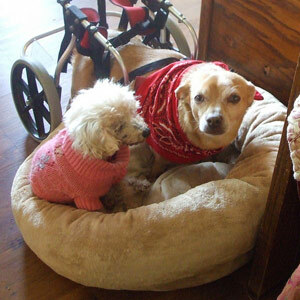 A spiritual understanding of suffering is invaluable when discussing quality of life in the context of animal hospice. The physical body, be it human or animal, is only a temporary vehicle to be occupied during our short time on earth. We are not our bodies or minds, but only dwell therein for the duration of life. We are first and foremost spiritual beings living a physical existence; Inherent in all beings, human and animal, is the ability to “depart,” faint, or become comatose if pain or suffering becomes too intense to bear. Very often we have witnessed animals leave their bodies for a time during illness or the death process and return again. Humans generally react with fear and trepidation to signs of pain and think of it as suffering, based upon their life experiences. Modern day life conditions us to resolve things quickly, to feel no pain, to suppress the symptoms and to make everything bad go away. This is the nature of today’s western society. Animals possess no such recall and live in the moment without our human acquired fear of pain or death. During the last several years, county Animal Care and Control has been called many times to visit BH to see if we are causing undue pain and suffering to an animal by not killing them—humanely, of course! I refer to Harley in this instance. Had we listened the first time, Harley would have been long gone.